Are Wild Boar Roaming Ireland’s Forests? Is there any truth in last week’s story that wild boar are making a comeback in Irish forests? “Wild Boar Strikes Fear into the Hearts of Walkers” roared the headline in the Irish Independent last week. The story that accompanied this sensational statement claimed that wild boar are making a comeback in Irish forests, and suggested that they are a danger to walkers and children. Alarming stuff, but if they paid more attention to coverage of “boar” sightings over the past two years they might not have got so carried away. Though “wild boar” were erroneously classified as an invasive species in Ireland in 2011, these are actually wild pigs that have escaped from farms and breed unchecked. Boar have long been extirpated on the island. 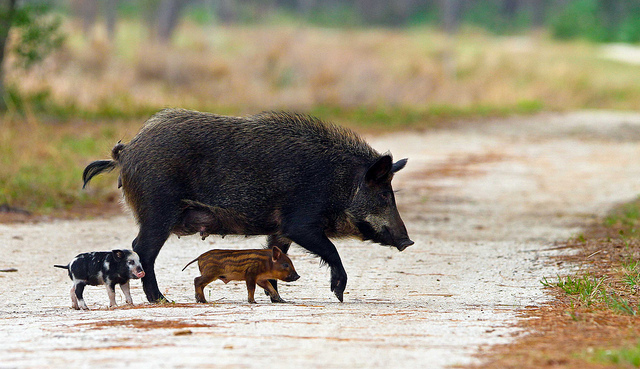 Hunters and wildlife rangers kill the feral pigs when they come across them (as they can spread disease among livestock), but their overall numbers seem moderate. I still wouldn’t want to go head to head with one on a dark night — full-grown pigs, especially sows protecting piglets, can be dangerous. But the suggestion that our forests and woods are unsafe appears to be overkill. We’re launching a monthly email newsletter.